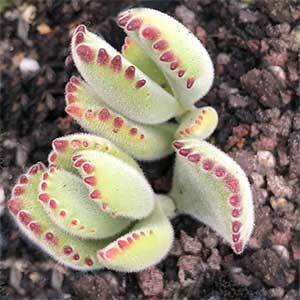 A fascinating small plant, the Bear’s Paw Succulent has leaves that are a soft mid green. Along the leaf magins are red to brown raised markings and these are the claws. In warmer climates, grow Cotyledon tomentosa outdoors, in cooler climates it can easily be grown indoors in a container. Over time it will reach around 50 cm in height (20 inches), it does have a naturally dense growth habit and looks good right through the year. The leaves and the stem are covered with indumentum (fine hairs). This is a very easy care plant, although it does require some natural light, or very good filtered light to grow well. Without good light the plant tends to ‘stretch’ and often the leaves can drop off. Another issues is when the ‘paws’ look a little soft and droopy, this indicates a lack of water. As for most Cotyledon varieties specialist cactus and succulent potting mix, or add some perlite to normal potting mix to ensure good drainage. Although you can propagateCotyledon tomentosa from leaf cuttings it is a little difficult. It seems to be far easier to look for a stem cutting on a larger plant, remove the lower sets of leaves and stick them in a very free draining cactus and succulent potting mix. If you want to try leaf cuttings use a very sharp sand and mist spray, however do not over do the moisture.